Tea, filter coffee and toast will be served to your table. 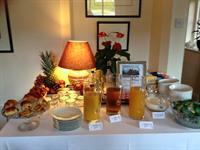 Please help yourself to the cold buffet which includes fresh fruit, yogurts, cereals, pastries and fruit juices. Lightly buttered toasted muffin, poached eggs and smoked salmon topped with a warmed hollandaise sauce. As above but using honey roast ham in place of smoked salmon. As above but using spinach rather than smoked salmon or ham. Eggs are available either poached, fried or scrambled. 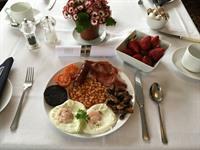 Sausages, bacon, grilled tomatoes, mushrooms, black pudding and baked beans are all available. 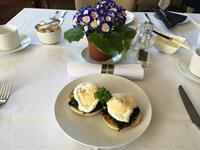 Vegetarian cooked breakfast is available on request. Most of our meats come from local independent butchers and our eggs are free range. We aim to serve local fresh produce wherever possible. Champagne or Prosecco are both available for that special occasion and that might just be at breakfast time!